Dr. Stephen G. Peterson was appointed Director of Bands at the University of Illinois in the fall of 2015. As Director of Bands, he conducts the Wind Symphony, leads the graduate wind conducting program, teaches courses in wind literature, and guides all aspects of one of the nation’s oldest, largest, and most storied band programs. Prior to joining the faculty at the University of Illinois he served as Director of Bands at Ithaca College in Ithaca, New York, for seventeen years. From 1988-1998 he served as Associate Director of Bands at Northwestern University in Evanston, Illinois. Dr. Peterson was also conductor of the renowned Northshore Concert Band. He held positions as Associate and Interim Director of Bands at Stephen F. Austin State University in Nacogdoches, Texas and has several years of successful teaching experience in the public schools in Arizona. Dr. Peterson maintains a busy schedule as a conductor and clinician, and as such, has appeared on four continents and in forty-two states. He is a member of the National Association for Music Education, the College Band Directors National Association, the World Association of Symphonic Bands and Ensembles, the Illinois Music Educators Association, and has been honored with membership in the prestigious American Bandmasters Association. He is also member of Phi Mu Alpha, Phi Kappa Phi, Pi Kappa Lambda, and an honorary member of Tau Beta Sigma, and Kappa Kappa Psi. He is past president of the College Band Directors National Association. 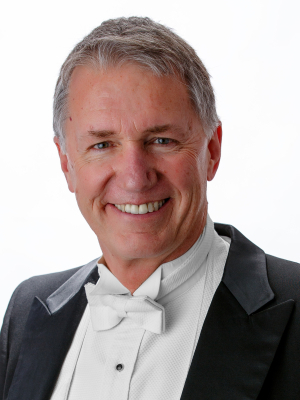 Dr. Peterson was the first to receive the Doctor of Music degree in wind conducting from Northwestern University and earned Master’s and Bachelor’s degrees from Arizona State University. In 2012 he was awarded the prestigious Ithaca College Faculty Excellence Award, recognizing his contributions to Ithaca College. His ensembles have appeared before national conventions of the American Bandmasters Association, the College Band Directors National Association, the National Association of College Wind and Percussion Instructors, the American School Band Directors Association, at Orchestra Hall with the Chicago Symphony Chorus, and at Lincoln Center.